We run 4 outstanding Program options for you and your family, group or Scout Troop. We customize each sailing charter trip to the individual needs of our customers. No matter what you want to do, where you want to go, whatever the size of your group and whatever options you want to include, contact us to discuss your trip requirements and let us tailor an awesome trip for you. Have you ever dreamed of learning to sail? How about heading off into the sunset to leave all your cares behind you as you drift along in the trade winds? Or, perhaps you've considered chartering a sailboat but you're concerned your lack of experience could turn a fun, family day out into a disaster! Well, this is the right trip for you; make your vacation count this year and learn how to sail with us in a tropical island paradise! Enjoy a 'learn to sail vacation' with the instruction and guidance of your own professional Captain to help you every step of the way. Progress at your own pace, there are so many options, it's your trip so you decide what you want to do each day. 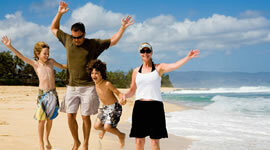 This is a perfect family destination, sandy beaches, sunshine, fishing, outstanding snorkeling, and so much more. Great food, lots of family fun, a 6-day adventure that brings endless excitement. There's so much more to your trip than just sailing. Go ashore to explore one of the islands, wander along endless beautiful beaches, sunbathe and then relax at your choice of beach bar and pool. 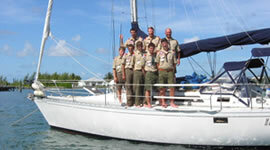 We've been teaching Scouts to sail and making it a fun experience for many years! 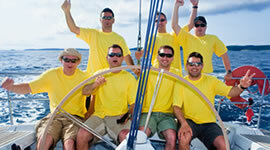 We offer your group great sailboats, fun Captains and awesome food. Most groups arrive with no experience but don't worry you can progress at your own pace and it's your trip so you decide what to do each day. You'll enjoy an awesome voyage from island to island within the protection of the Barrier Reef in the Sea of Abaco. Our professional Captains are registered Small Boat Sailing Merit Badge Counselors so your group can bag that Merit Badge. Choose dates that suit your group. You can sail as much as you want each day, swim and snorkel at different reef locations, catch fish,explore scenic island settlements and much more. Your International High Adventure trip takes place in a remote location, in a tropical foreign country. We run outstanding, exclusive wilderness learning experiences for College & University students. We'll help your students acquire a range of practical life-skills, which will prove invaluable in their academic and professional lives!Your students will remember their voyage of self-discovery and learning to sail & scuba dive for a lifetime. Discover how your school will profit from improved teamwork & leadership skills. Every participant benefits from hands-on leadership experiences to develop their individual leadership style. This is so much more than a tropical vacation. Learning to sail encourages the development of a sense of individual responsibility and promotes self-reliance. It's essential to work as a team on a sailboat, so each participant is constantly engaged in personal challenges oriented around effective teambuilding. Exciting and fun filled sail training in the beautiful yet remote environment of the Sea of Abaco - it's the perfect location. All training and equipment is provided, no experience required.